As I mentioned in my post on Hemingway’s hunger, many of the cafés and restaurants that the great man habituated remain open today. But with Hemingway being a man of such large appetites, and thus a habitué of so many venues, how can the nostalgic tourist decide which Hemingway haunt to drink at first? As a public service, I embarked on a mission to visit all of Hemingway’s familiar drinking spots and offer up my impressions as a guide. What follows is Part I, surveying the bars of Montparnasse. The guide to Hemingway’s Latin Quarter will follow at a later date. For those paying only short visits to the city of light, I hope that this post helps direct you towards the best way to spend your time and euros. Of course, the truly ambitious and deep-pocketed might seek to visit all of Hemingway’s haunts in one uproarious circuit. If that’s the case, feel free to invite me along – especially if the drinks are on you. La Rotonde: My first visit to one of Hemingway’s endroits took place entirely by accident, within days of my arrival in the city. Such things are possible in Paris, where the past sits cheek-by-jowl with the present. We happen to live in Montparnasse, where Hemingway lived and hence where he drank. Our part of the quartier is far more quiet than Hemingway’s (thankfully), so a few nights into our stay in Paris we went out with some visiting friends (yes, we had visitors on our first day in Paris), and wandered until we found a place that looked lively. Voila, La Rotonde! It was only when I looked down at the placemats, covered with the signatures of all the Left Bank greats who ever had a drink there, that I realized we had arrived at an institution. Squeezed in beside Hemingway’s name were Picasso, Man Ray, Ionesco, Modigliani, Braque, Max Jacob, the list goes on. Everyone drank at La Rotonde. As Hemingway put it in The Sun Also Rises, “”No matter what café in Montparnasse you ask a taxi driver to bring you to from the right bank of the river, they always take you to the Rotonde.” Back in its heyday, the owner of La Rotonde was known for his generosity. That tradition lives on in the mixed platter of free snacks they serve with their drinks. While many Paris bars will give drinkers a few potato chips or olives or peanuts, La Rotonde sets the standard by offering all three. 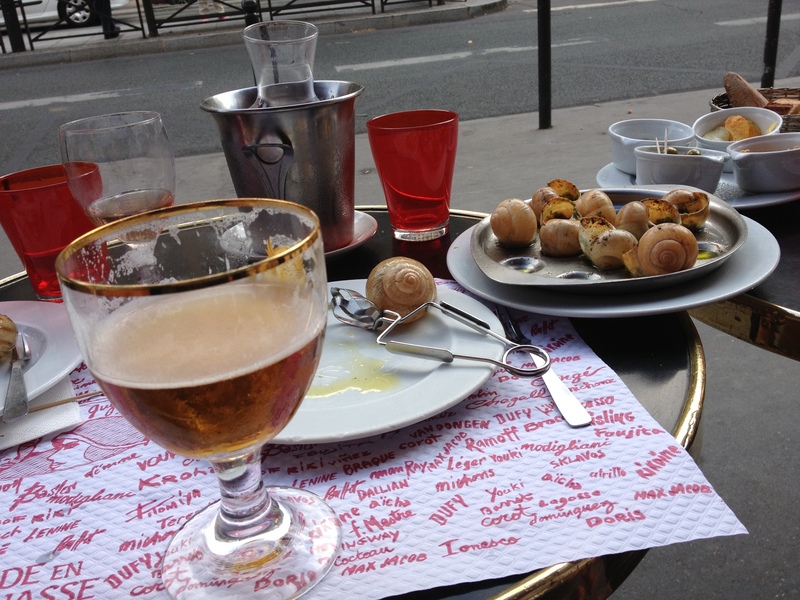 We ordered beer and wine and a dozen escargot (25€). Those were so good that, following Hem’s example, we ordered a second round of everything. Situated on a very busy intersection, the people watching opportunities at La Rotonde‘s outside terrace are prime – especially if you snag at table at the point, where you can watch passersby on both Boulevard du Montparnasse and Boulevard Raspail. From teenagers heading to the movie theatres and cheap eats further down the Boulevard du Montparnasse, to lively old women dressed to the nines, there’s a feast for the eyes. Neighboring tables are also worth checking out. See the woman feeding her dog, feeding herself, and smoking all at once? See the fellow tourists pleasurably spending the money they’ve been suffering to earn? One thing you won’t see are tables filled with upcoming artists and writers. Try a right bank neighborhood maybe. Here is a place to visit the past, not witness the future. Since everyone went to La Rotonde, Hemingway avoided its busy tables when he wanted to write. Instead, he spent his working hours at La Closerie des Lilas, down the street from his apartment on rue Notre-Dames-des-Champs. Although the famous cafés at the corner of Montparnasse and Raspail were only one avenue away, “people from the Dôme and the Rotonde never came to the Lilas,” according to Hemingway. Instead the clientele tended toward elderly bearded men and their wives or mistresses, who showed little interest in the young author, allowing him to write undisturbed for hours. Today Closerie feels, if possible, even more out of the way than it was back in the 20s. The outdoor seating, which once hosted a lively café culture, has been enclosed behind a high scrim of greenery. The statue of Marshal Ney, Napoleon’s favorite general who was executed on this spot in 1815, guards the leafy fence from outside, no longer able to look down on the restaurant’s diners. Within the closerie, or garden as it translates, the crowd is more Paris than tourist. A recent issue of Le Point, the French newsweekly, opens with an editorial describing a meal two of the magazine’s journalists shared there. They both had the haddocks pochés à l’anglaise. But I chose a dish from the menu of French classiques, since I eat plenty of English food at home, ordering quenelles de brochette sauce homard (18€), pike mousse dumplings in a lobster sauce, with a glass of dry white wine. I almost had a Julia moment eating them. Although I’ve read about quenelles, and seen them in pictures and cooking shows, I’ve never had the chance to eat them before. Or, if I did, then the ones I ate before were unmemorable. These were perfect. They had the texture of a soft but toothsome meringue, like the inside of a marshmallow that was warmed in hot chocolate. They were floating in a brick red sauce that carried the flavor of the sea, not briny, but imbued with the memory of waves and salt air. Tiny snippings of chives clustered on top, dark green against the red. And a few sautéed mushrooms lay between the quenelles for contrasting texture. In true Hemingway fashion I had built up a hearty appetite before arriving by crossing the city on foot and not having anything to eat for many hours. By the time I sat down, I was light-headed and empty inside. Unlike Hemingway, I am not twenty-two, and even with my well-won hunger I could not finish the rich dish. But I ate until je n’en pouvais plus, I couldn’t have anymore. (An aside to English readers: don’t tell a waiter you are plein at the end of a meal, that translates to pregnant or drunk. Use je n’en peux plus, which means I can’t have any more. The French typically drop the ne, so it sounds more like j’en peux plus.) After my meal was cleared, I sat reading at my table for another hour. I love how restaurants or cafés in Paris allow guests to remain at table for as long as they like after finishing their meal. No one ever hurries me with the bill until I ask. Perhaps in my solitude, unbothered by waiters or fellow diners, I had a Hemingway moment. Something tells me that when Hemingway ate at Closerie it was a lot less expensive. I would have had oysters but they were 30€ a half dozen. Having moved here from the city of buck-a-shuck, I cannot swallow an eight dollar oyster. However, I would go back for the quenelles. p.s. notice that like its competitor La Rotonde, Closerie has the signatures of famous guests adorning its place mat, although these guests are of a more recent vintage than those who adorn the mats at La Rotonde. The names at Closerie include Roger Waters, Charlotte Rampling, and Dolf Lundgren! The weather this past week in late September has been glorious: a last gasp of summer, warm enough to wear sandals, and especially welcome following the week or two of rainy cool days that preceded it. Last night, after dinner, we set out for night-caps at the corner of Boulevard du Montaparnasse and Raspail, the epicentre of Montparnasse’s bar scene in the 1920s. The patios of the restaurants lining Avenue Général Leclerc, near our part of the quartier, were filled with diners and drinkers. When we reached Denfert Rochereau, nearby the entrance to the catacombs, every table at the local outpost of the Indiana café was packed with drinkers in their early twenties. (Indiana café is a French chain of inexpensive Tex-Mex bistros with branches near many of Paris’s major tourist sites. Why name a Tex-Mex chain after the notoriously rust-belt state of Indiana? Perhaps as a kindly hint that what you’ll be served there is a thousand miles away from real Tex-Mex food. Of course, I’m judging by eyeball alone, what I’ve seen on people’s plates as I walk by. I’m much too much of a snob to actually eat there.) If Indiana café was vibrant, the scene at Montparnasse and Raspail, our destination, presented a sad contrast. There were plenty of tables at Le Dôme, across the street from La Rotonde, and those that were taken hosted a mostly older crowd. I transformed from decrepit to youthful in one short block, a rejuvenation much less expensive than plastic surgery. The patio at Dôme is much smaller than the one at Rotonde, with far fewer outside tables. We snagged one right on the street and ordered a glass of wine each (5€ for all glasses of wine). The waiter brought the bottles to our table and filled our goblets to the brim. We picked at the small dish of green olives that came with our drinks, sipped our wine, and watched the foot traffic. Its lights twinkling at us from across the Boulevard du Montparnasse, La Rotonde appeared far busier than our own patio. So it was in Hemingway’s day, when feeling scornful of “collective instinct” he chose to drink at Le Dôme. The Dome was crowded too, but attracted more working artists and fewer dilettantes. Last night the crowd at Le Dôme tended more towards the bourgeoisie than artists. One rotund man in a striped shirt who stumbled from the bar to the curb, where he struggled to coordinate smoking a cigarette and standing up at the same time, reminded me of Mr. Creosote from “The Meaning of Life.” One more wafer-thin mint and surely he would have exploded. As we watched the restaurant’s diners slowly trickle out, Tim remarked on how many older men seemed to be enjoying the company of younger women. The platters of fruits de mer are not cheap at Le Dôme. I could have been seduced in my youth by the promise of oysters and langoustines. In fact, I could have been spirited away last night by someone willing to trade my olives for oysters. It’s just a good thing for Tim that nobody offered. Further along the Boulevard du Montparnasse, towards the Montparnasse tower, are La Coupole and Le Select. A block from the busy foot traffic of Raspail, their outdoor seating lacks the interest of Le Dôme and La Rotonde. Hemingway breakfasted at Le Select, we had glasses of wine. Behind us sat a table of French men enjoying enormous cigars, probably following a meal at the famous steak-frite restaurant next door, Le Relais de l’Entrecôte. The Select offers a decent selection of wines by the glass, but not much else. I drank there out of a sense of duty to you, dear readers, and felt no sorrow to leave when I had finished my glass. Afterwards we darted across the street to look into La Coupole. The restaurant is massive, with an enormous cupola in the center of the room, which explains the name. Brightly lit and filled with art, Coupole is more restaurant than café. They have no patio, and so we didn’t stop for drinks. Côtes du Rhône and Coteaux d’Aix en Provence at Le Select. One more place we didn’t stop to drink is Le Falstaff, which is on the rue du Montparnasse, branching off the Boulevard. We did stop there once intending to have a drink, but finding it empty and forlorn we moved on to a likelier location. This was before I embarked on my mission to survey all Hemingway’s haunts, when I was guided in my drinking choices solely by thoughts of pleasure. Falstaff looked inviting from the outside, with wooden walls and wooden stools and wooden tables and a great beer list. But an air of sadness hung about the place on the afternoon we almost visited. I was happy to leave. According to the wisdom of the internet, Hemingway and Fitzgerald met for the first time at Le Falstaff. 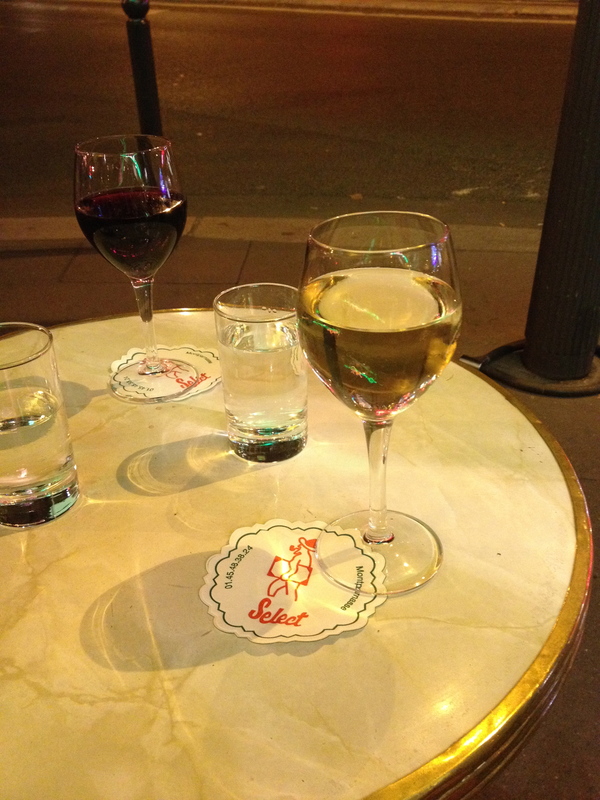 But in A Moveable Feast, Hemingway places their first meeting at the nearby Dingo Bar, on rue Delambre. The Dingo has long since closed up shop, replaced by the restaurant L’Auberge de Venise. If I have any regrets now about not drinking at Le Falstaff, they are not rooted in nostalgia. In fact, now I must make an odd confession: I have no nostalgia about Paris in the 1920s. I am no Gil Bender. Although I am a historian – maybe because I am a historian – I have no emotional longing to live in the past. My regrets about not drinking at Le Falstaff relate entirely to the present moment. I feel sad that I cannot write about the experience here. This whole escapade has just been an excuse to write, an attempt to gather material that I could shape into words on the page. I’ve had more pleasure composing this post than I had drinking at any of Hemingway’s bars. Ok, maybe I had a little bit of fun drinking at Hemingway’s bars. Enough at least to propel me onward towards the difficult working of drinking my way though his Latin Quarter regulars, which I’ll relate in my next post on Hemingway’s haunts. A few years ago I went to the bar in Ciudad Juarez where Hemingway drank. The margarita was invented there. It was the best one I ever had! I am not a fan of his writing but he did apparently have good taste in bars.